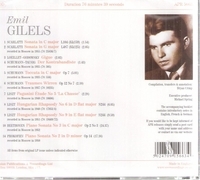 "Along with Sviatoslav Richter (to feature later) Emil Gilels was regarded as the greatest of the Soviet pianists and, as he was allowed to travel to the west, he become know as one of the supreme pianists of the 20th century. Latterly he became known as a great player of Beethoven & Brahms. Here, in a selection of his earliest recordings, we see a different side to his talent as he reveals an astonishing virtuosity in such warhorses as the Liszt Hungarian Rhapsodies and the Schumann Toccata. Balancing the recital we also present the earliest of what were to be many Beethoven recordings and a performance of Prokofiev’s 2nd Sonata which reminds us why he was the dedicatee of that composer’s 8th, and greatest, Sonata."